Looking for good kids’ bunk beds in 2018? Want to give your children a solid, strong, cool, and durable bunk bed that they can enjoy? Sometimes I ask myself, do these manufacturers test their own bunk beds before putting them on sale? The quality for some of them is absolutely horrendous, and people keep buying them because there is little to no help from online. 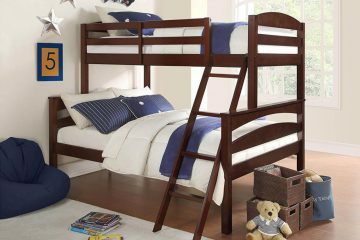 That is why I will interfere and help you, parents, to choose the best bunk beds in the price range of $300-600. If you read my previous article talking about affordable bunk beds for kids, you’d notice that I was furious with some of their assembly instructions. Like how does one come up with such things! As it’s my job to critique beds, it’s also my job to give credit where credit is due. And that is exactly what this bunk bed gets from me. Their instructions are super good. Very easy to assemble once the bunk bed parts are in the room. Some companies send you packages where every single part is mixed with other parts, and the only way to differentiate them is to read messy text instructions that don’t even have a single image. This one has no such problems. 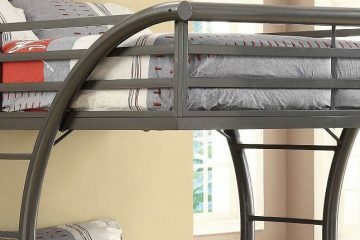 Even if you are alone at the moment, and no help is near, you could assemble this 214-pound solid bunk bed for your kids with ease. No external help or hardware is even needed. Although it might seem like a small benefit, it does play a role. 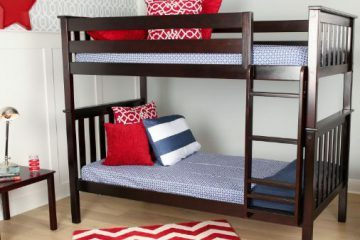 You’ll feel it when you assemble bunk beds. Bunk beds are the hardest thing to assemble in the house. Luckily, American Furniture manufacturer made it super easy for us. In terms of material, it’s also good. It is worth the price. The problem with cheaper bunk beds is that they squeak often, or shake when people are on top of the bunk bed. You’ll get no problems here. Tests were even made where 3 people went up top (with a total weight of 450 lbs), and the bed didn’t even start to bend. Kids are going to be super safe on it. Hardwood material is always good, but since hardwood trees like oak or maple are slow growing, the price for them is higher. At least you’ll know that you are getting top-of-the-line furniture. 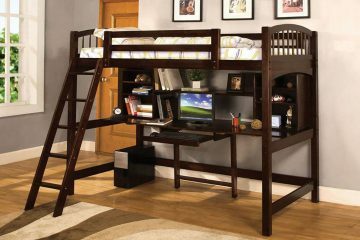 That’s why this bunk bed is one my list. I am also a big fan of diagonal ladders. If you or someone ever had a “pleasure” of sleeping on bunk beds with straight horizontal ladders, you’d know how uncomfortable it is to climb down from it. I even skipped the ladder in my youth and jumped straight down. But since this ladder design is smooth and well made, that problem does not exist here. Speaking of design – I chose twin to full bed. That means the lower bed is wider than the top bunk. 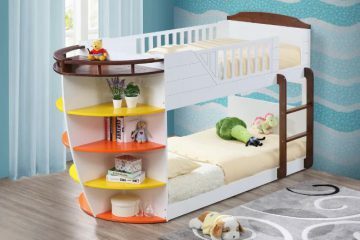 That allows your kids to be of different sizes or weights, and still sleep comfortably on the beds. Lower bunk bed also has more leg room if he or she decided to sleep diagonally. 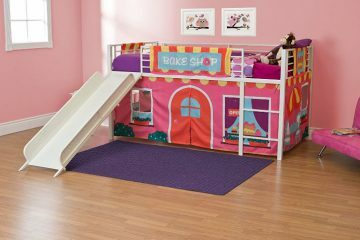 I rarely recommend people to buy those smaller bunk beds for 3+ year old kids. They aren’t much cheaper and you’ll have to buy a new one after a year or two because your child is growing like a mushroom on a rainy day. If you go with moderate size immediately, you won’t regret it. Your kids will sleep on it just fine. How do I know? Mine did without any issues, as well as other kids judging by feedback. 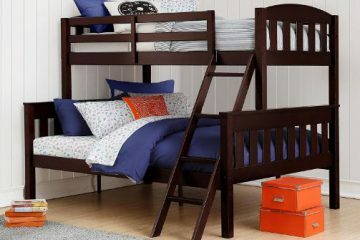 But how does this bunk bed differ from others? Luckily, everything in this picture is included (only mattresses are not). Mattresses though are almost never included. If you want mattresses, check these out! This bunk bed supports 8 and 10-inch mattresses, twin and full. If I had to change something about this bed, it would probably be the size of those drawers. They are fine as they are, but they have a lot more potential in terms of space. Another side of them is completely void, so they could have made drawers a bit deeper. Other than that, it’s a great choice for parents. You are not going to experience much wear, and your beds are going to serve your kids for years to come. No change is necessary till they are in late teens. Although the price for this one is a bit lower than others, it does belong in the same bracket due to its quality. The problem with lower priced beds is that even though they might look the same, they do not stay the same over the years. They start to have problems with cracks, squeaks, and all sorts of other annoying problems. 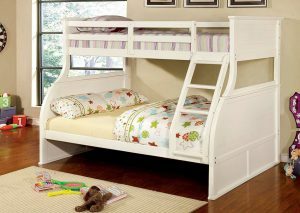 This bunk bed is a definition of quality. I admit design of it is not its strongest suit. It looks like it’s one of the most generic beds out there. Even drawers are not included. But for this solid price point, you are getting something that won’t disappoint you and your kids. It is its durability. They will love this bed. It doesn’t move, it doesn’t crack due to additional coating, and it has enough durability to even support adults (since it’s made for kids, I don’t recommend it for big adults, no matter what anyone says). 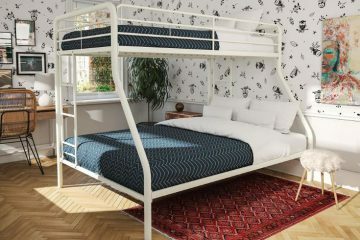 The only thing I would maybe change about this bed is the ladder. I am not a big fan of horizontal ladders as I mentioned. 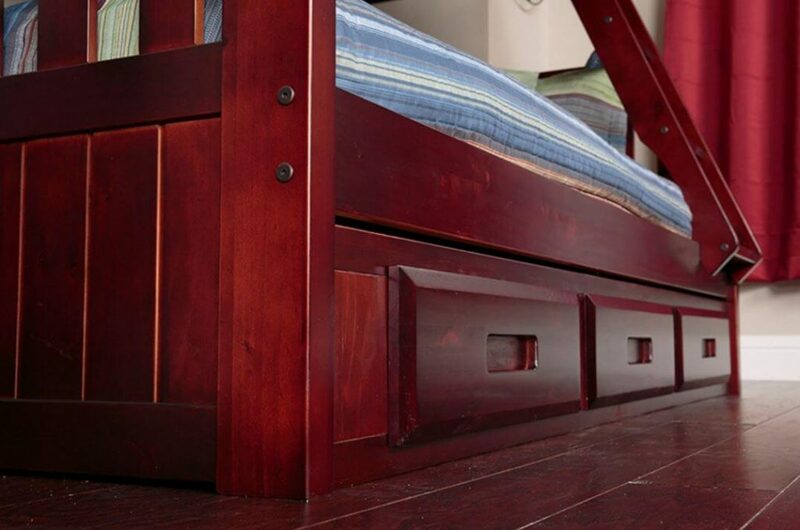 It’s also placed on sides, so keep that in mind when designing the room and placing the bunk bed. Otherwise, terrific bed. I would recommend buying this “Signature Sleep Contour 8 Inch Mattress“. It’s often bought together with the bed, so it’ll fit perfectly. 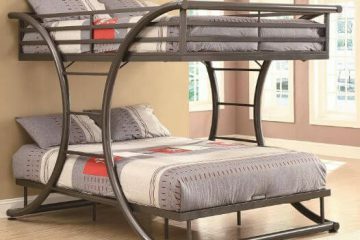 Since this bunk bed is twin over twin, no wider mattress is needed. Although all of these beds that I mention here are for every gender, I’d say this one is more suitable for girls. It goes extremely well with the pink design and looks good from every angle. It has strong safety guard rails and the ladder that I prefer the most. The material is respectable, a mix of solid wood and wood veneer. As with all the bunk beds at this price range, they are tested for durability. As with my first recommendation, it’s very easy to assemble, so instructions are clear. Once it’s ready for use, it’s going to look even better than on pictures. You can place whatever full and twin mattresses you want, as long as they are 10 inches or under. Here is my recommendation: Signature Sleep 8-inch mattress. One weird thing about this bed is that it has a HUGE sticker on it. It also shows the weight limit for some reason. It doesn’t suit the bed, so when you have time, you can remove it. It’s just for visual preference. 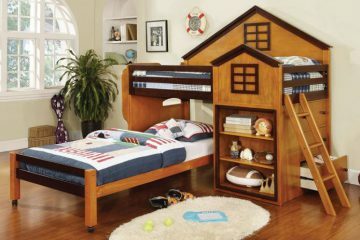 All in all, another good bunk beds for kids to get! If you liked this article, share and follow us on social media! 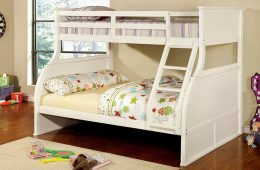 Previous ArticleBest Kids’ Camping Bunk Beds of 2018 – You’ll Love Them! 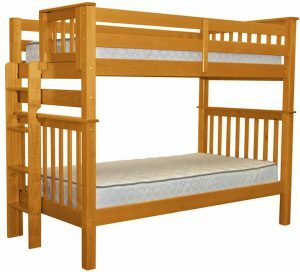 Next ArticleYour Zone premium twin-over-full bunk bed – GOOD or BAD? Do these come with mattress? They do not, as usual. I like the American Furniture bunk bed but the ladder placement is inconvenient. Can you put it on the right side instead so that we don’t have to reposition the furniture in our kids’ room? Yes! You can move to the right side if you want! 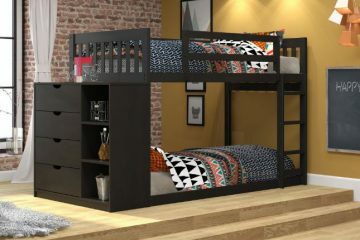 I love these bunk beds you chose but I wish you would add more 🙁 At the moment I can’t really find the perfect one I am looking for. I have a specific look in mind but it’s not really good. Done! I’ll update it with more variety of bunk beds soon! 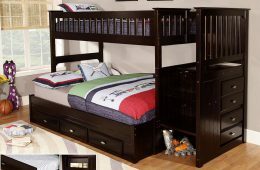 I have this bedz king bunk bed. I can confirm it’s VERY strong. My 2 boys never had any problems with it, even though they are quite all over the place and like to play and hang from every position. I do like the one with the trundle. Haven’t encountered many that let you have it for this price range. I hope you don’t have to purchase it individually? I’ve seen products that show one thing on the picture but then i find out that you have to pay a sum on top of it. Hello there! 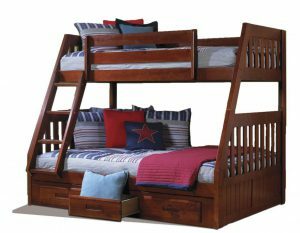 My aunt is asking me to search some of the best kids bunk beds. They’re moving houses and they wanted a new bunk bed for their new apartment and for their kids. I want to help them and I searched it up online. I ended up into your article and I founf it very informative and helpful. I’m pretty sure my aunt will like this top 3 bunk beds.